Sienna Glow Loquat is a hybid of Eriobotrya deflexa, probably a cross with Majestic Hawthorn and has very similar characteristics to Coppertone Loquat. 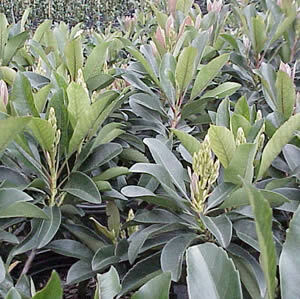 This is an evergreen shrub with dark glossy green foliage, the new growth is coppery in color. Sienna Glow has an upright densely branched growing habit, reaching a height of 8 feet and a width of 6-8 feet. In spring slightly fragrant pink flowers form, but this hybrid produces no seed.